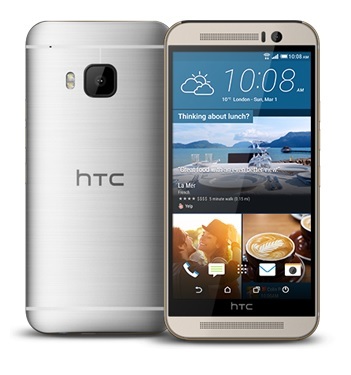 HTC’s natural successor to the fairly successful One M8 is their new flagship phone, the HTC One M9. The One M9 features a familiar metal body, but demonstrates few new changes. In terms of big hardware changes, we are getting the M9 in the same 5 inch screen framed by a chassis smaller than the M8, a 20MP camera shielded by a sapphire glass lens, and a significant boost in battery capacity. HTC doesn’t mess with a good thing; the One M9 comes with a gorgeous all metal two toned body designed to fit perfectly in your palm. It seems that the two-toned colours and the curved back work together to add depth to the design of their new phone. It’s also rumoured that HTC may have looked toward modern luxury brands such as Rolex and Montblanc for the inspiration to their classy phone. Even HTC’s own advertisement of the M9 makes it out to look like a sophisticated accessory, much like a piece of jewelry is advertised. HTC has always worked hard to make a phone that integrates well into its users’ lives—be it physically or through its features—and it’s definitely apparent in their One series. In an effort to give its owners the best in-hand and in-pocket feel, the M9 is now physically shorter in length and width, but thicker by 0.02 mm, and lighter by 3 grams in comparison to its predecessor. Reports are that the phone is now less slippery and easier to grip. We believe that this was a good move made by HTC because keeping a 5 inch screen in a physically smaller phone means that there is a smaller border between the edge of the screen and the edge of the phone, which gives the illusion of a bigger screen. Given HTC’s choice of staying with what works, it’s unsurprising that HTC decided to stay with a flat screened phone when other brands have ventured into the world of curved screens. The M9 is quite flat in the front, making the M8 and M9 look almost indistinguishable at first glance. The difference lies in the back. When comparing the backs of the M8 and M9, users will immediately be able to tell that the curved back of the newer device adds an immense amount of depth in terms of colour. This phone will come in variations of silver, gunmetal grey, and gold. One of the reasons many customers held back from purchasing the M8 was the camera—it lacked quality. The M9 sees an improvement in this department, and we’re very hopeful that it will fix all the previous issues. The M9 now adorns HTC’s UltraPixel camera in the front and a 20MP camera protected by a clear and scratch resistant sapphire lens in the back. What is UltraPixel, you might ask? A brief explanation of the UltraPixel feature is that it uses four pixels per one dot in a photo. While this means that photos are smaller in size, it allows for significantly more light, creating better selfies even in environments with low or poor lighting. Although HTC answered customers’ requests for a higher resolution rear camera, it seems like not many other advancements were made to improve the M9’s primary snapper. Reports say that the M9’s camera does not fare well in comparison to other available camera phones. The photos have excessive noise and are under exposed. Of course, you have to remember that this is the primary camera for a phone—serious photographers would likely be turning toward proper photography equipment for most photos. For daily foodblogging, family photos, and other various casual photographic needs, the M9 camera should be sufficient. The phone’s screen is still the same 5 inch, 1080×1920 pixel display with 441 PPI density. It’s shielded with Corning Gorilla Glass 4, a slight upgrade from the previous Gorilla Glass 3 on the M8, and it looks like HTC chose to avoid a QHD screen in order to extend the battery life. At some point, the human eye is incapable of discerning the difference between a high resolution display and an even higher resolution display. We aren’t sure of what that limit is, but we think HTC feels that a longer lasting battery is more important than a display that only some will be able to appreciate to its fullest potential. The M8 had a gorgeous display, so it’s expected that the M9, with the same display specifications, will as well. Even though the pixel numbers aren’t as high as some other phones, we support HTC’s move because it’s already proven to be more than sufficient. Speaking of battery life, the M9 gets a boost in battery capacity, now sitting at 2840mAh. Although this may not be much in comparison to other available phones, it is still above average—especially when it is coupled with the lower resolution screen and HTC’s own Extreme Power Saver mode. The M9 will also support Quick Charge 2.0, supposedly making it possible to charge from 0 to 60 percent in just 30 minutes. It’s important to note that the Quick Charger adapter will not ship with the phone, so customers will need to pay separately in order to use the feature. 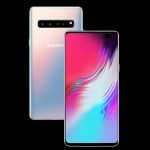 It also features the 64-bit Snapdragon 810 processor, meaning that the phone will have four cores operating at once, but have eight cores overall. The octa-core processor has four cores running at 2.0GHz and four cores running at 1.5GHz. When the phone doesn’t require as much processing power, it will switch over to the slower four cores, effectively assisting with battery life depending on what its users demand. All these features add up to a phone that will easily last a whole day—if not more—on just one charge. The M9 will come with 32GB of internal storage and 3GB of RAM. It looks like we wont be getting the option to choose a 64GB model, but HTC compensates by making memory expandable up to 2TB with a microSD card. Although a 2TB microSD memory card is not currently available, the phone will be able to support SandDisk’s recently introduced SanDisk Ultra, a 200GB microSD card. As technology continues to develop, it will find ways to fit more memory into the little microSD card—and when it does, the M9 will be ready to support up to 2TB. 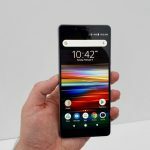 This phone, without entering the “phablet” category, is the perfect size for utilizing expandable memory for general entertainment. Since BoomSound was introduced, it became the standard for which other phone speakers were compared to. Naturally, users of the M9 will get an upgraded BoomSound system with updated clarify, volume, and bass. There are many benefits of having front facing speakers, and the M9 comes with quality that rear-speakers just can’t compete with. 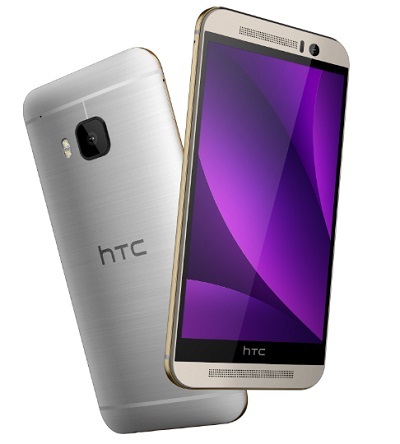 The M9 will ship with HTC’s own Sense 7.0. Although it’s not quite as sleek and simple as the stock Android firmware, HTC has not left its users without features of their own. Sense 7.0 has a widget called “Sense Home.” What’s special about this widget is that it will display different apps depending on your location. 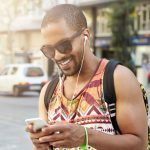 You can set your home and work address; when the phone senses that you’re at the specified location, it will automatically pull up useful apps. For example, you might get the email app at work, or you might get music controls at home. Another notable Sense feature is the Theme Generator. HTC’s addition of the new Theme Generator falls in line with their long standing efforts of user life integreation. The new user-friendly app will prove to be very interesting because while it’s not quite as comprehensive as other third-party apps that provide the same feature, it is very easily accessible and it comes stock with the phone. The Generator will allow you to make your own themes by analyzing the colour palette for apps and icons, but the Theme Generator does more than just change the colours— it almost completely revamps the user interface by changing the colours, fonts, icons, and sounds. 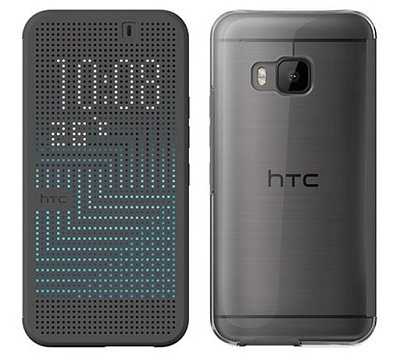 HTC will also offer users of the new HTC One M9 a few extra goodies to accessorize with (separate purchase, of course). Among various official HTC accessories, we’ve chosen to talk briefly about the DotView 2 case and the IP68 rated case. You’ll be familiar with the DotView 2 case if you’ve used it on the M8. It’s just a regular rubberized flip case with a twist: it has many little holes in it that allow for an image to be displayed through the dots. Various information and notifications can be viewed this way. While it can be useful and it definitely looks very cool, we find it to be a little bit gimmicky because you’ll still have to open the case in order to see or respond to notifications. Simple games, such as Brick Breaker, can also be played with the case. The IP68 rated case boasts protection from dust and water, much like brands such as Otterbox. Given the some other companies’ treks into water proofing their phones, the HTC Active Case is a reasonable—albeit rugged—response. This case will water proof the M9 for up to 3 meters and make it resistant to shock for falls up to 2 meters. Although this isn’t a very pretty or slimming case, it’s perfect for those who spend much of their time in an environment where their phones are consistently exposed to risk. It is also rumoured that owners of HTC’s new flagship phone will receive a free two year account for 100GB of Google Drive storage. 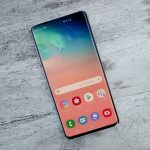 It will work in conjunction with the phone’s “One Gallery” app, which consolidates all of your photos into one application with searchable thumbnails. Our concluding thoughts about HTC’s new One M9 is that this phone is an evolution, not a revolution. If you have the M8, it might not be worth the upgrade. As always, the phone is physically beautiful and has an intuitive software. However, when the M8 and M9 are placed side by side, the average person would have difficulty with differentiating the two phones. Granted, the M9 has received upgrades to both software and hardware, but that’s not to say that it’s a huge step up from its predecessor. While we appreciate that HTC sticks with what works, we aren’t sure that this is the best time to come out with successor sporting such minor enhancements. Even though HTC improved on an already near perfect design, with the recent release of Apple’s ventures into phablets and Samsung’s revolutionized Galaxy S6, 2015 might prove to be a tough year for HTC. Almost all HTC One M9 devices will come locked to a service provider. You can expect major carriers such as Rogers, Fido, Bell, Telus, AT&T, and T-Mobile to provide this phone. If your phone is locked to a carrier, you can unlock your HTC One M9 with an unlock code provided by cellunlocker.net. Keep in mind that this is the same method that carriers use to unlock phones. Click here to get your HTC One M9 code now!